PT Bank Mandiri (Persero) Tbk - Bank Mandiri (IDX :BMRI) or referred to as "Mandiri Group" is the largest state-owned financial services institutions in Indonesia. The Company engaged in general banking industry. Its business include Consumer Banking, Small Medium Enterprise (SME) and Micro Banking, Commercial Banking, Corporate Banking, Treasury, Financial Institution and Capital Market. As a state-owned company, Bank Mandiri is majority owned by the Government of Indonesia. At present, Bank Mandiri is 60% owned by the Government of Indonesia and 40% by investors and general public. Based in Jakarta, Bank Mandiri now has 112 regional offices, 8 overseas representative offices, 2,457 domestic branch offices, 1,082 sub branch offices, 273 cash offices, spread across Indonesia and 8 branches abroad, about 17,388 Automatic Teller Machines (ATMs). 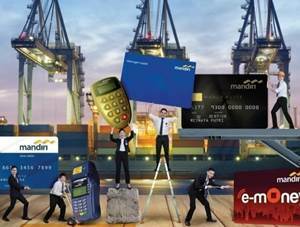 Bank Mandiri also supported by 12 principal subsidiary companies and 3 associated entities. Bank Mandiri is widely known nationwide as the first largest commercial banks in Indonesia in term of total assets. According to PT Bank Mandiri (Persero) Tbk latest quarterly financials report as cited by JobsCDC.com, total sssets of Bank Mandiri in the position of the end of third quarter of 2016 (Q3 2016, ended in 30 September 2016) amounted to Rp 975.16 trillion. In term of financial performance, PT Bank Mandiri (Persero) Tbk booked total consolidated income for the year of Rp 12,637.01 billion in Q3 2016. This total consolidated income down by 16.64% from Rp 15,159.98 billion in Q3 2015. Referring to its Annual Report, Bank Mandiri's total interest and sharia income in Q3 2016 amounted to Rp 56,885.23 billion increased by 8.07% compared to the year 2015 (Q3 2015) amounted to Rp 52,637.20 billion. JobsCDC.com now available on android device. Download now on Google Play here. Please be aware of recruitment fraud. The entire stage of this selection process is free of charge. 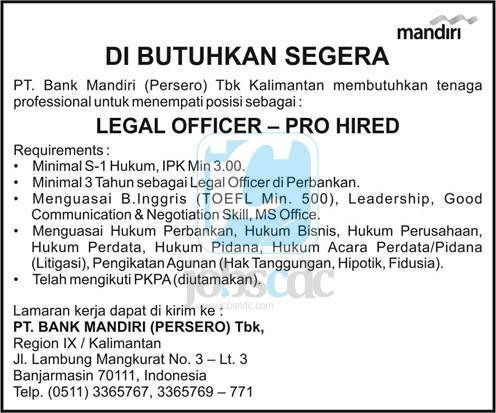 PT Bank Mandiri (Persero) Tbk - Officer Pro Hired Bank Mandiri December 2016 will never ask for fees or upfront payments for any purposes during the recruitment process such as transportation and accommodation.